Of course it's Trevor! Of course it is! 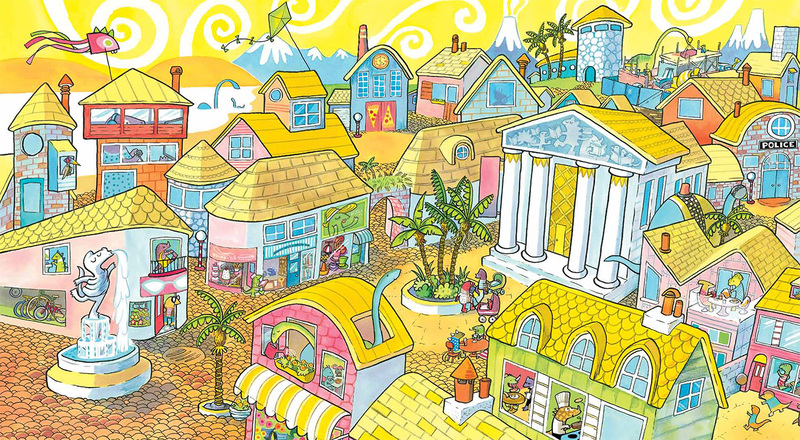 "The absurdity of that page is a scream. A) What does a T-Rex that large even want with a climbing frame? B) How did such an enormous beast get onto or even into the climbing frame in the first place, let alone then stuck in it and C) ... AGAIN?!?!?!?! 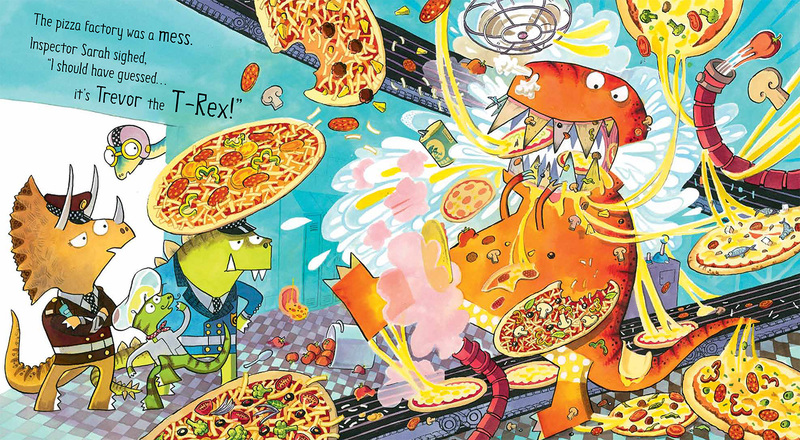 First in a pizza factory, gorging his fat face off on pizza (I love that Trevor's face is 87.3% teeth, and that he's managed to stuff at least two complete pizzas into his gaping gob; that really is the stringiest, gooiest cheese of all time, each loop leading your eye to Trevor), then on a sequential-art rampage through Dinoville, a town otherwise so quaint and quiet that its police precinct's bulletin board has plenty of room for a missing cat poster! 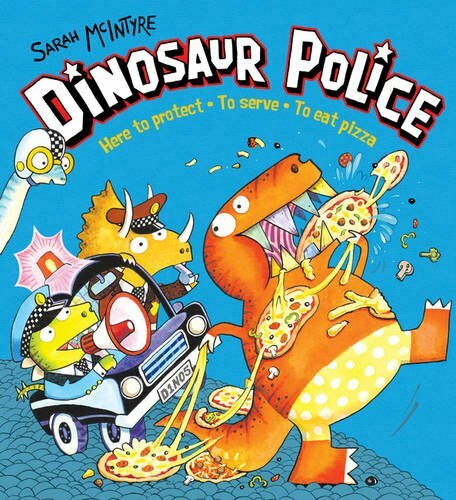 Dinosaurs, of course, come in all shapes and sizes. 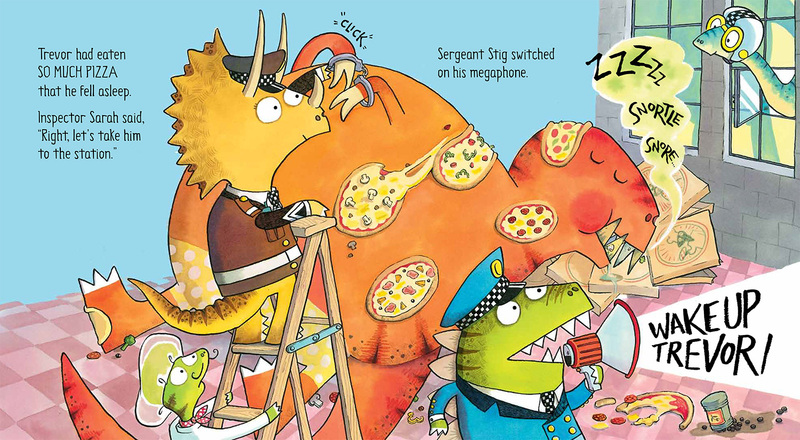 Sergeant Stig O'Saurus (originally of Irish stock) and Inspector Sarah Tops (snort!) fit nicely into their uniforms, colour-coded to denote rank but mostly to complement their hides' hues, I think. Officer Brachio, however, is of a decidedly bigger build and therefore can't fit into the police car let alone a standard uniform, so he has his own flashing light for emergencies just like this. 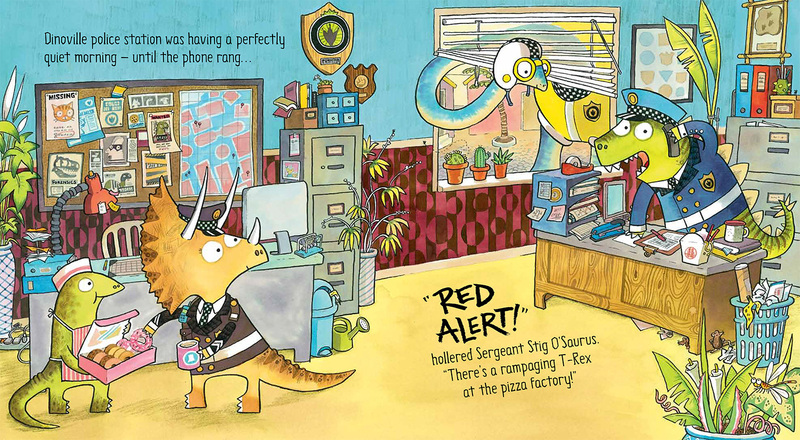 "Sergeant Stig O'Saurus and Inspector Sarah Tops were on their way faster than you can say "WOO WOO". Officer Brachio bellows "WOO WOO!" anyway. Because, hey, every officer needs a siren! A late addition to our phenomenally popular Page 45 Philip Reeve and Sarah McIntyre Section because you really did demand it, this is yet another beauty for youngsters' shiny wide eyes to wander around, spotting background details like the multiple narratives going on all about town in the pre-title double-page spread which they can fill in for themselves with their wild imaginations. Once more the delightful absurdities had me howling. Last time it was Trevor's climbing frame fiasco; here it's Inspector Sarah Tops diligently doing her duty... by handcuffing Trevor. Because you wouldn't want to actually immobilize a T-Rex, would you? Or secure that massively muscled mouth with its fulsome array of gigantic gnashers!!! No, what you really need to do is deal with those functionally useless forelimbs! I'm still chuckling several hours later. Deliciously coloured with enormous warmth, I'm now going to call Pizza Italia, and I will have pineapple on my pizza, so there!